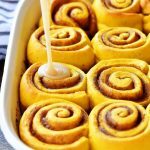 These copycat Cinnabon Cinnamon Rolls are delicious, soft and taste like the ones from the famous chain! Oh, Cinnamon Rolls. My most favorite roll in the universe. 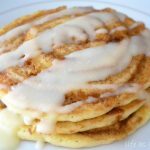 I’ve always been a little hesitant to post a Cinnamon Roll recipe on my blog, because honestly, I had not yet found the perfect recipe for them. Until now. 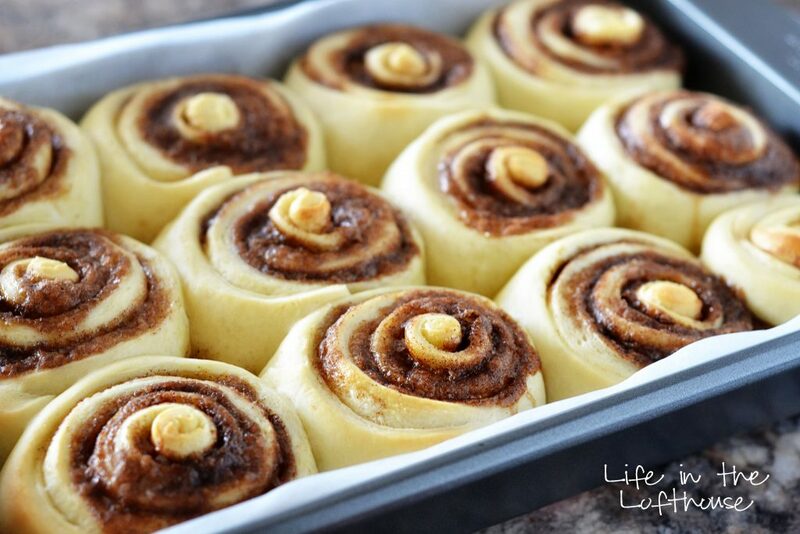 These rolls are a Copycat version of Cinnabon Cinnamon Rolls I found on Lauren’s Latest blog. Let me tell you, they were the best Cinnamon Roll I’ve ever, ever, ever had! And I know that’s a bold statement. 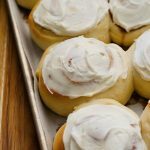 I have made dozens of Cinnamon roll recipes, that were actually pretty darn good, but none of them measured up to these amazing rolls I’m sharing with you today. 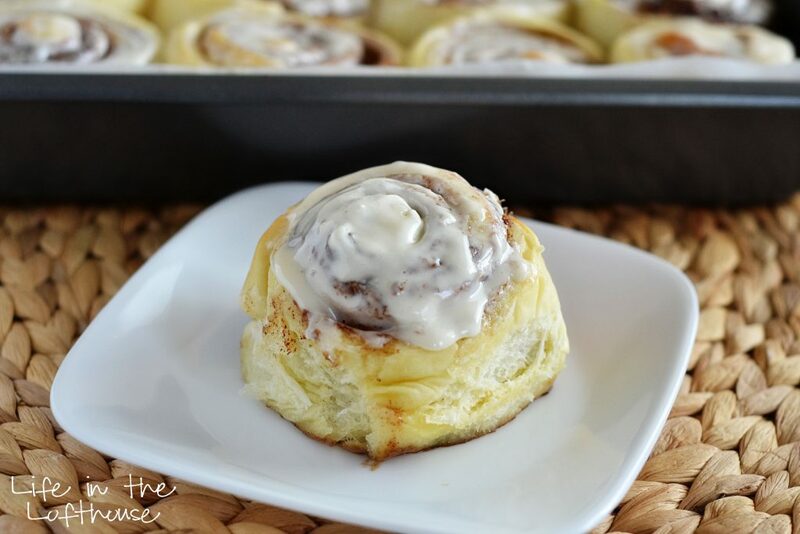 The most delicious, soft, amazing Cinnamon Rolls! For the dough: In a stand mixer, fitted with the dough hook, pour in the water, yeast and 1 Tablespoon of the sugar. Stir together, then let stand for 5 minutes, or until foamy. Once mixture is foamy, stir in the remaining sugar and salt. Stir on low speed for about 20 seconds. In a small bowl, add the buttermilk, oil and egg. Whisk together until the egg is incorporated. Pour this mixture into the yeast mixture. Stir another 20 seconds on low speed. Pour in 2 cups of flour into the mixer and stir on low speed until just combined. Continue to add in the remaining flour, ¼ cup at a time, until the dough cleans the sides and bottom of the bowl. Do not add more than 5 cups of flour total. (The dough should be slightly sticky) Turn on mixer and knead dough for 5 minutes. Remove dough from bowl, grease it with a little oil, then replace dough. Cover with plastic wrap and let rise 1-2 hours or until doubled in size. For filling and cutting rolls: In a medium size bowl, add the brown sugar, cinnamon and cornstarch. Stir to combine. Set aside. Punch down dough. Flour a large, clean work area (counter or table top) liberally with flour. Roll dough out to a 18×28 inch (or close to) rectangle. Spread the softened butter over the dough, leaving a 1-inch border untouched with butter. Sprinkle the sugar/cinnamon mixture evenly over the butter, then gently press into the dough using a rolling pin. Roll the dough up, into a tight log. Score dough every 2 inches, then slice rolls using those marks. Place rolls into a parchment lined, then greased 9×13 baking dish. Cover with plastic wrap and let rolls rise another 1-2 hours, or until doubled in size. Bake rolls in a preheated 350 degree F oven, for 20-25 minutes, or until tops barely start to brown. Watch closely! Don’t over bake! For the frosting: While the rolls are baking, cream together the cream cheese and butter. Stir in the vanilla, corn syrup and lemon. Gradually beat in the powdered sugar until all is combined and creamy. 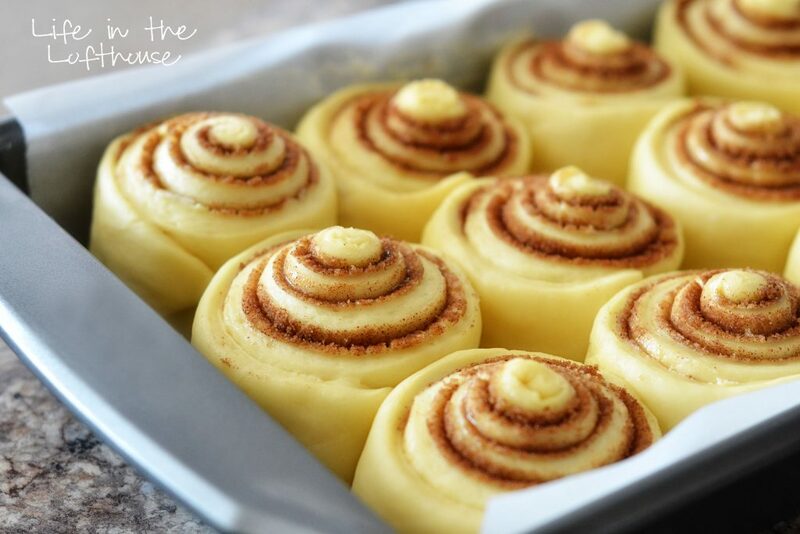 Once rolls are done baking, immediately frost with half of the frosting. The frosting will slightly melt down into the rolls! Yum. Once the rolls are almost cooled, then frost with remaining frosting. Oh my word, those looks mouth watering-ly (is this even a word?) delicious! 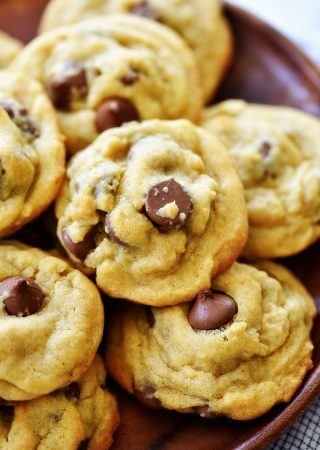 Must make these and perfect for Christmas morning. Making these this weekend! 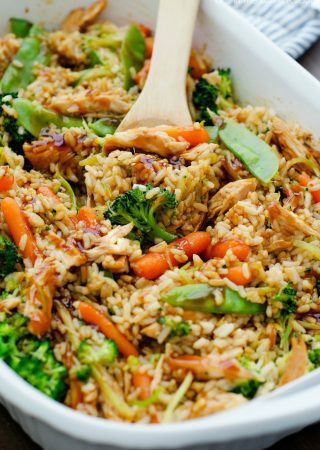 Does this recipe easily double? Can you taste the lemon?! Thanks Holly! ps. I love your blog and recipes!!! So, I was thinking today, I wonder what Holly is up to? I hadn’t seen a post in forever. Looks like you have had all kinds of yummy posts in the past month or so. I must have not updated my reader to your new name? Do you want to know something funny? 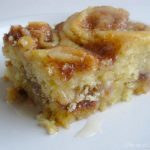 I made these cinnamon rolls a few weeks ago (yours look way way prettier than mine did), I had sour cream noodle bake on my to-make list next week and the same thing with a few other recent recipes!!! We must crave the same food . . . ha ha . . . great minds think alike, right? These look amazing! I’ve been using a King Arthur recipe for the last few years and I can’t wait to try this one 🙂 Thanks for sharing. 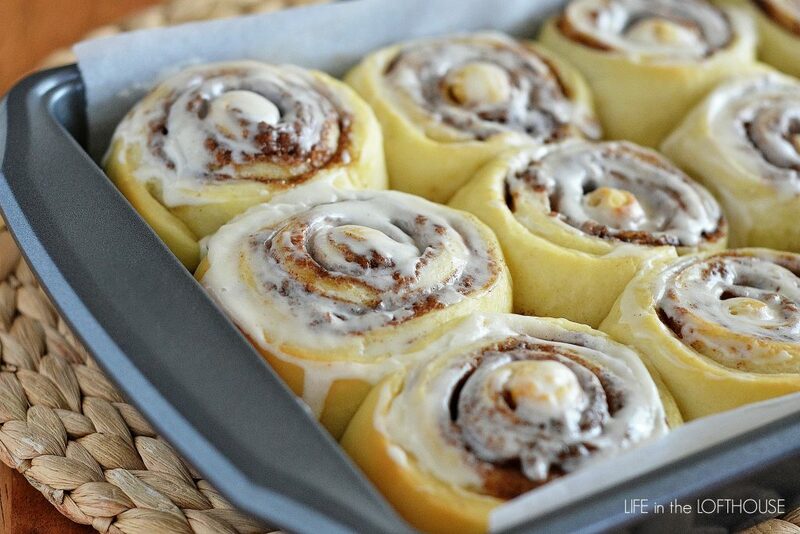 Seriously, like the prettiest cinnamon rolls ever. Pinned! 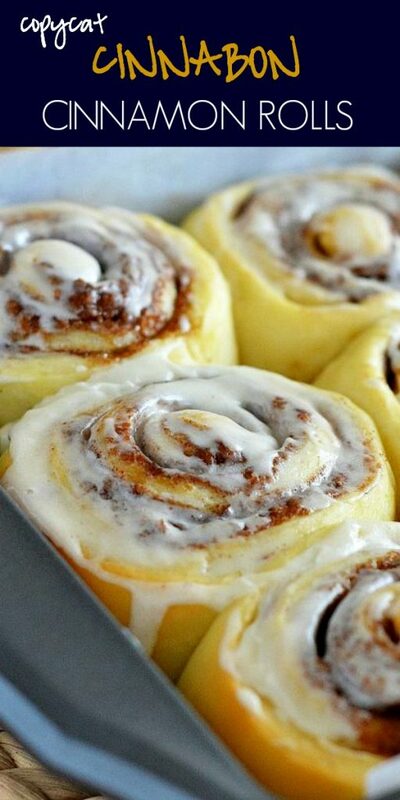 my question might sound a bit obvious (cinnamon rolls are not very usual here in Brazil), but from which of the sides do you start rolling the dough up? They look gorgeous, gonna try them next weekend! I want to make these for Thanksgiving morning (yes, I’m ambitious). Wondering if there’s a way to make the dough/prep the filling the night before? Sorry if this is an obvious question in any way – I’m not a baker. Gina, yes you can make these a day ahead. Make recipe as instructed up to cutting and placing rolls in the pan. Cover and refrigerate over night. 4 hours before you bake them leave them out on the counter to rise. These were glorious and I am not an expert baker by any means! They turned out perfectly!!!!! This has become a permanent recipe for me! So glad you shared this…..Thank you! 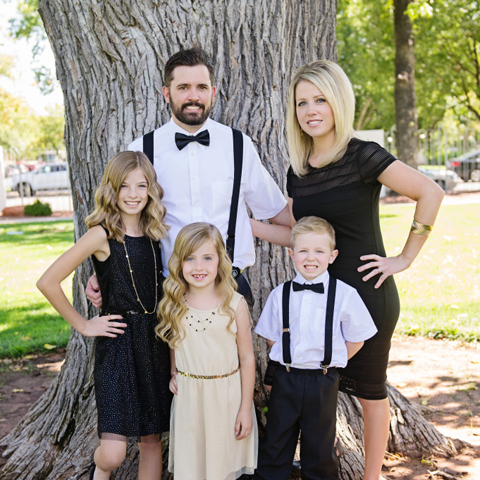 Congratulation Holly. I rarely post a comment on anything but I made this recipe and they are way better than cinnabon’s. I just felt I had to tell everyone. I can’t wait to make this again. 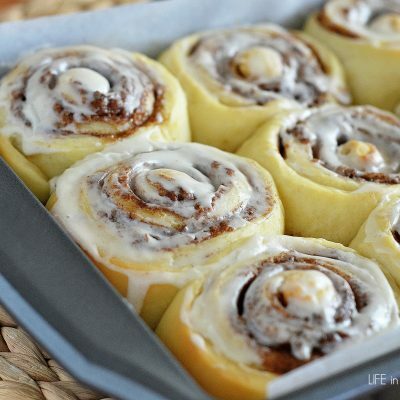 These CINNAMON ROLLS make me really ROLL…Thanks a million! Hi a Holly. Just curious if it’s possible to make the dough in a bread maker(machine)? 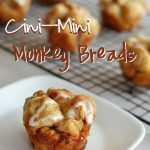 I am interested in mini rolls – how could I use this recipe for mini rolls? I have been searching for the perfect cinnamon roll recipe. I’ve tried a few and my family have humored me by eating them. I tried this recipe and it came out perfect. Delicious!!! A huge thumbs up from a household of boys and picky eaters. Aaannd….my husband is taking some to his boss!!! !